I'm a big fan of breaking games and worming my way into areas players aren't meant to see. Sometimes you learn a little about the development process, but it's mostly about that polite, British thrill of being somewhere you're not supposed to be but doesn't exist so doesn't matter anyway. Often there's nothing but a long drop outside the confines of the map—WoW's unused Quel'thalas and Gilneas zones (before it was patched in) are personal favourites, and they were just poorly textured planes. However, every so often, you find sights worth seeing. Redditor UncomfortableNPC escaped the confines of Rocket League's Wasteland arena and discovered a strange new world. 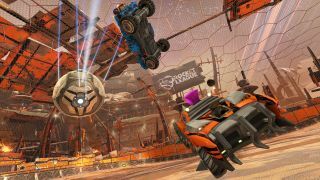 There's lot of light-hearted speculation in the office surrounding the 'lore' of Rocket League. Are these RC cars or are real human pilots going up in smoke each time I demolish someone in spite? What dystopian society could condone such a sport? UncomfortableNPC's discoveries suggests things are worse than we thought. Alien monoliths dominate the landscape for miles uncounted. Beyond the immediate scenery of the arena, towers and great metal constructs lie hidden. Who built them? What do they want from us? Why are there so many useless assets cluttering up the level?